The Native American Map provides a useful overview of the location of the various tribes of American Indians of North America. The map is color coded and gives a visual idea of the many tribes of American Indians and the vast area the indigenous population of American Indian Tribes covered. The above map is an historical map and sadly illustrates the dying culture in respect of the American Indian tribes. The tribal areas illustrated are those at the earliest time of European contact, as far as can be determined. Since European contact occurred at different times in different areas, there are no accurate historical Native American maps reflecting the location of the North American Indians of the entire continent in a single time period. 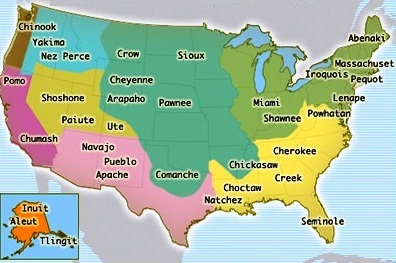 The cultural groups of American Indians are categorised according to divisions of American Indian Groups as illustrated on the Native American Group map. There are ten primary groups categorised as follows which are are separated by location shown on the map. 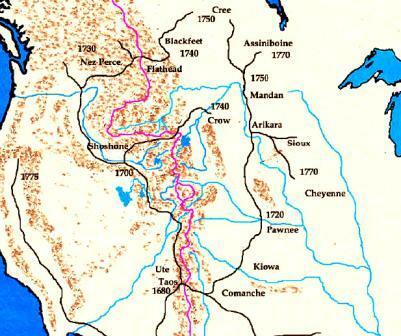 The Native American Map shows the location of famous tribes in the areas as detailed below. Many of the Indian tribes migrated to different areas following contact with the Europeans and made homes throughout the North American continent. The introduction of the horse, leading to the Indian Horse Culture, by the Europeans made the area of the Great Plains very appealing due to the plentiful buffalo that roamed across the prairies and plains. Tribes including the Winnebago, Iowa, Otoe, Omaha, Kansa, Osage, Sioux or Dakota, Pawnee, Hidatsa, Crow and the Mandan people migrated to different areas ranging from the northeast, the southeast, the Plains and Northern California. Native American Map. Discover the vast selection of pictures and videos of Native Indians. The pictures show the clothing, weapons and decorations that can be used as a really useful educational resource for kids and children of all ages. Our series of videos enable fast access to the images, pics, paintings and pictures together with information and many facts. 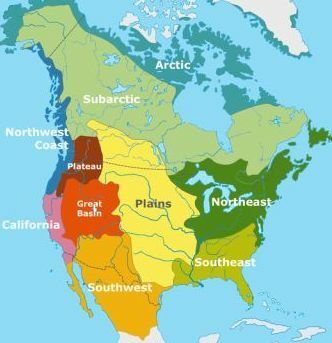 We hope that this article on Native American Map will assist in your studies or homework and that you will enjoy watching the videos featuring many pictures of the Indians. A great educational resource for kids on the subject of the historic locations of Indian tribes shown on the Native American Map.